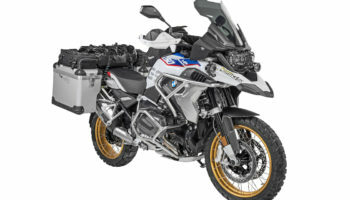 If your adventure rides happen on a BMW F850GS, you should be riding with Touratech Zega Panniers. In this video, Iain will show you how to install the racks! Hello, I’m IaIn with Touratech USA and today we’re gonna be installing the Touratech pannier racks for the F850GS and F750GS. The Touratech pannier racks are made out of stainless steel. They’re media blasted and electro-polished, so they look great and they last a long time. The pannier rack system is made up of three main components. You’ve got your left side rack, your right side back, the crossbar for the back of the pannier rack, and then the hardware kit. The hardware pack consists of four spacers. Two are 5 millimeters tall, and two are 4 millimeters tall. There are four M8 bolts. Two are 50 millimeters long, and two are 35 millimeters long. There are two small M8 washers. There are four large M8 washers. There are four small M6 washers, two M6 button head bolts, two M6 Nyloc nuts, one piece of foam tape, two plastic inserts for the crossbar in the rear, and two plastic face pieces for the crossbar in the rear. To begin this installation, remove the seat from your motorcycle by inserting the key into the lock cylinder below the front of the seat and turning the key clockwise. Remove the passenger foot peg brackets from both sides of the motorcycle. You’ll use a Torx T40 wrench to remove the two bolts on each side. Now, remove these four bolts at the top of the tail section. You’ll use a Torx T40 wrench to remove these. With the bolts removed, these pieces are removable, but we want to make sure that we leave this plastic piece and this shouldered spacer on the bike in all four positions. Now, take the foam pieces you’ve cut into four strips and apply them right on the edge of each of the four mounting positions. To install the first pannier rack, start on the forward upper mounting point. Take one of the longer M8 bolts, one of the large washers, put a little thread locker on the threads of the bolt, and grab one of the 5 millimeter spacers. Put the spacer over the mounting hole, grab the rack, and rest it lightly in place, and slide the bolt down. Be sure to leave all these mounting bolts completely loose until we’re finally done with the installation. For the rear mounting position, we’re gonna use one of the shorter M8 bolts, one of the large washers, and one of the small washers. Make sure to put a little thread locker on the bolt. The washer installs between the pannier rack and the bike. Now, we’re gonna reinstall the passenger foot peg bracket. We’re gonna reuse the stock bolts. They all already have plenty of thread locker on them, so no need to add more. Make sure that you use the 4 millimeter spacer at the forward mounting bolt, since the pannier rack adds 4 millimeters of thickness at the rear mounting bolt. The rack installation on the opposite side is exactly the same as what we’ve just done. Make sure you use the long bolt and the 5 millimeter spacer at the front, the short bolt and the two washers at the rear. Don’t forget the thread locker. For the crossbar at the rear of the pannier rack, we start by installing these two plastic spacers in the end. They just slide into the end of the bar. Install the crossbar using the M6 button head bolt, the plastic face plate, two of the small M6 washers, and an M6 Nyloc nut. I like to install a small amount of Anti-Seize on these M6 bolts, since they’re threading into a Nyloc nut. So, put the plastic faceplate over the boat with the flat side facing the washer, hold the crossbar up on the pannier rack, and insert the bolt through the holes. With the crossbar just held in place by the bolts alone, now you can install one washer and the M6 locknut on the back side. Use a 4 millimeter Allen tool and a 10 millimeter spanner to tighten the crossbar up first. When tightening these M6 crossbar bolts, be sure to put the final torque on the bolt, using the actual spanner that’s turning the nut. This way, you won’t damage the head of the bolt. Tighten down the four mounting bolts at the top of the pannier racks. Do this using a 6 millimeter Allen drive tool. Tighten up the passenger foot peg brackets using a Torx T40 bit. Don’t forget to tighten up the passenger foot peg bracket on the other side of the motorcycle, as well. Pannier racks are now installed on our F850GS. You’ll notice at the back of the bike that even without boxes fitted, they add a lot of protection to the rear end of the motorcycle. If you want to mount any kind of boxes on there, all of our Touratech cases attach really quickly to the back of the bike. And a lot of aftermarket cases also have mounting options that can be used with our racks. If you want to learn more about the products we make for this bike, visit our website, touratech-usa.com. And if you want to share photos with us of the trips you’ve taken and the places you’ve been with your bike, visit us on social media. We’d love to see you.